This will allow you to focus on finding the perfect homes for you and your family. Determine what is important to you such as particular schools, neighborhood amenities, monthly mortgage payment, public transportation, walkability, location to work, etc. Make sure you include home owner’s assessments, utilities, and taxes when calculating the monthly mortgage payment and homeowner’s insurance. Maintain files – digital or print – for all warranties, insurance documents, contracts, etc. Searching the MLS is as Easy as 123! Searching for property in the local market has never been any easier than it is now. You will be able to search the Local MLS – Multiple Listing Service. 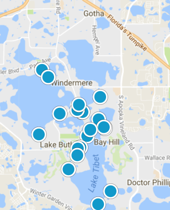 Our website will allow you to search for all active MLS listings from all brokers updated daily for sale in Orange, Lake, Osceola, Polk, Seminole, Volusia Counties. You will be able to search for Single Family Homes, Condos, Multi-Family Homes, and land for sale including all distressed sales from Foreclosures and Short Sales. Our website is designed to be the only tool you will need search the MLS for your next home in the Orlando and Surrounding Areas. We are here to assist you and our goal is to make your buying process easy. You will be able to start your search to find your next perfect home. Find a home for sale by location, price, and amenities you want. You will be able to search by County, City, Communities or Subdivisions. Robert R Reids Add SubDv. Baldwin Park Ut 01 50 121 SubDv. Bunker Hill Sec 02 SubDv. Rare opportunity for investor's, downtown S Orange Ave strip shopping center. This is the heart of the commercial district. Fully leased and occupied. College Park 5th Add To C C Sec SubDv. Plaza South Tower Coml Condo SubDv. Lake Eola Historic District SubDv. 9.89 Acres land. approved for 32 SFR. Orlando Central Park 02a SubDv. Spring Lake Terrace 1st Add SubDv. R F Starkey Add SubDv. Orwin Manor Stratford Sec SubDv. Preserve At Laureate Park SubDv.